“Elizabeth Taylor”, the actress. 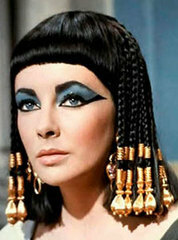 . .
“Liz Taylor”, the star. . .
and, of course, “Liz”, the tabloid headliner. . .
Ms. Elizabeth Taylor, billed as the “last great star” from the Golden Age of Tinsel Town, passed into the annuals of Hollywood iconography at the age of 79 almost a year ago. During her lifetime, this global goddess touched everyone’s life – as a skilled actress, a Hollywood screen icon, and the gossamer stuff of legends. As the actress, Elizabeth Taylor’s film career spanned almost six decades, beginning in 1942 and ending in 2001. Like a string of diamonds, some sparkling more than others, Taylor brought a unique facet to every role – including the dull ones. Movie roles in Cat on a Hot Tin Roof, Cleopatra, The Taming of the Shrew, Who’s Afraid of Virginia Woolf?, National Velvet, Conspirator, A Place in the Sun, Suddenly, Last Summer, The Mirror Crack’d, and Malice in Wonderland were the central gems that added luster to her professional resume. Along the way, Elizabeth’s secondary roles in Ivanhoe, Raintree County, Butterfield 8, The VIPs, The Sandpiper, Reflections in a Golden Eye, X, Y, and Zee, and a few others, managed to be forgotten quite easily by her legions of devoted fans. Taylor went on to win numerous honors, including two Academy Awards, three BAFTA’s, four Golden Globes, a SAG award and another Academy award for Lifetime Achievement. Since she held dual citizenship as an American and British subject, Elizabeth was awarded the British OBE, making her Dame Elizabeth Taylor (are we surprised?). Liz Taylor, the “star”, shined on the world stage, too – and in many different directions. Realizing at an early age that she was a priceless commodity, Liz made sure she always got paid – and quite well. During the production of Cleopatra, she successfully negotiated a 7 million dollar package (salary plus 10% of the gross profits) that became the gold standard of star power for future Hollywood contract A-list stars. She was one of the first of the glitterati to brand herself by creating a designer perfume line, beginning with her signature scent of “White Diamonds”. Liz also used her star power to tirelessly promote HIV-AIDS awareness and money for medical research, especially at a time when ignorance and fear of the disease kept many stars mum on the subject. Liz lived in the glare of the scandal sheets, newspapers, and movie magazines for her entire life. A product of the Hollywood Studio System, her early press was manufactured by the studio press department. After reaching adulthood, however, her private life often threatened to overshadow that very public persona, and the studio lost control of she who was Liz Taylor. Interest in her many marriages and romances – not to mention their breakups – sold millions of print copy and kept her devotees in the movie theatres. The age of the paparazzi blossomed with the Liz-Richard-Eddie controversy, making Liz’s movie, Cleopatra, the box-office blockbuster of 1963. The interest surrounding Liz never quite diminished, even after her passing in March of this year. Yet, it matters little what name we knew her as, for the famous line goes, “That which we call a rose by any other name would smell as sweet.” And this reviewer won’t say “Rest in Peace”, because Ms. Elizabeth Taylor will continue to dazzle us forever. This article originally printed in Outside Hollywoodland, March, 2011.